Be the first to share your favorite memory, photo or story of Cleon. This memorial page is dedicated for family, friends and future generations to celebrate the life of their loved one. 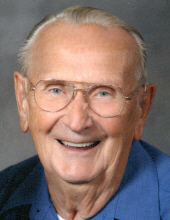 Cleon Richard Burton, 85, died Thursday, January 31, 2019 at Altercare of Bucyrus. Cleon was born February 12, 1933 in Sidney, Ohio to the late Rev. Gilbert D. and Mimia (Wilson) Burton. He was raised in the Quincy, Ohio area and moved to the area to find work. For a short time, he worked for the Railroad before taking a job at Swan. Soon thereafter in 1953, he was drafted into the US Army and was stationed in Germany. Following his discharge in 1955, Cleon returned to Bucyrus and while lapping one evening, met Mary E. Starlin. The two hit it off and on November 4, 1956 they married. Cleon or Burt as he was known to his Swan buddies, returned to his job and would put in 46 years of employment until his retirement. He and Mary were members of Zion Chapel which merged with Grace UMC and he’s currently a member of Bucyrus UMC. Cleon and Mary operated a small farm earlier in life, producing a lot of hay and oats for their horses and later rented it out. He enjoyed raising Appaloosa horses which his kids showed all over the state. After their children left home, he and Mary dabbled with thoroughbred horses and they loved racing them in Cleveland, Columbus, Cincinnati and occasionally at the Mountaineer in WV. Cleon was a hard-working individual but appreciated watching an old western when he had the chance. In addition to Mary, his wife of 62 years, Cleon is survived by three sons, Randy (Kathy) Burton, Rick (Jenny) Burton and Steven Burton; one grandson, Austin Burton and three step-grandchildren, Mitchell Stuckert, Nikki (Jon) Saunders and Travis (Shannon) Watson along with their children, Brylon, Kaeston and Daxson as well as many nieces and nephews. He was preceded in death by three brothers who died during infancy; four sisters, Lillie Tippin, Mary McFarlin, Ruby Finrock and Mildred “Mick” Leasure and one brother, William “Gene” Burton. His family will receive friends from 2-4 and 6-8 pm Monday, February 4 at Wise Funeral Service. Funeral services for Cleon will be held at 10:30 Tuesday at Bucyrus UMC with Pastor Mike Corwin officiating. Burial will follow in Brokensword Cemetery with Military Rites provided by the American Legion Post 181. Donations can be made payable to Bucyrus UMC and will be accepted at the funeral home or at church on morning of funeral. To send flowers or a remembrance gift to the family of Cleon R. Burton, please visit our Tribute Store. "Email Address" would like to share the life celebration of Cleon R. Burton. Click on the "link" to go to share a favorite memory or leave a condolence message for the family.